Excited that Nintendo plans to release iPhone games in a new collaboration with mobile developer DeNA? 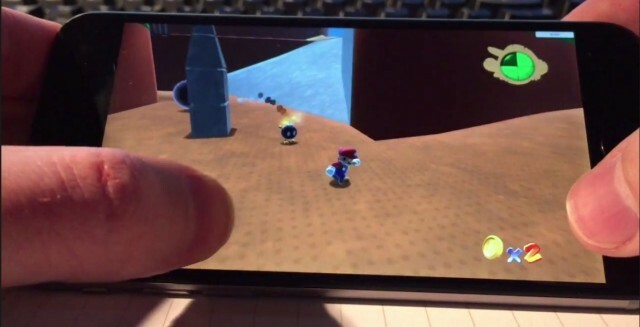 Here’s a taste of what it could end up being like: Nintendo’s gaming classic Super Mario 64 running on an iPhone! Unity developer Erik Roystan released a playable version of the first level of Super Mario 64 yesterday. Not only did it look, sound and play exactly like the real thing, but it worked within your desktop browser. The cool part about being a Unity project is that Unity is super portable, which is why you see so many developers using it these days. The same project used to make Mario run around in your browser window with a little help from James Fietcher from Mobot who converted it into an iPhone project and added basic virtual controls resulted in Super Mario 64 HD running on my iPhone 6. As you can see, it looks and plays great. Sadly, though, it seems that as much as we would all love to play Super Mario 64 on our iPhones, Nintendo’s plans for releasing iPhone games isn’t so much to port old classics as it is to come up with new intellectual properties as part of its DeNA partnership. But you never know! If fans can get Nintendo’s classic games running on an iPhone, so can the Big N.
This entry was posted in Apps and tagged nintendo 64, Super Mario 64. Bookmark the permalink.